After months of hard work, Peter Dawson of Mountain Creek, QLD, unveiled his stunning new backyard. The new outdoor space boasted a new pool, decking and a DIY SlimWall. The modular fence was customised with expressed join features, integrated lighting and a dynamic colour scheme for a truly unique backdrop. 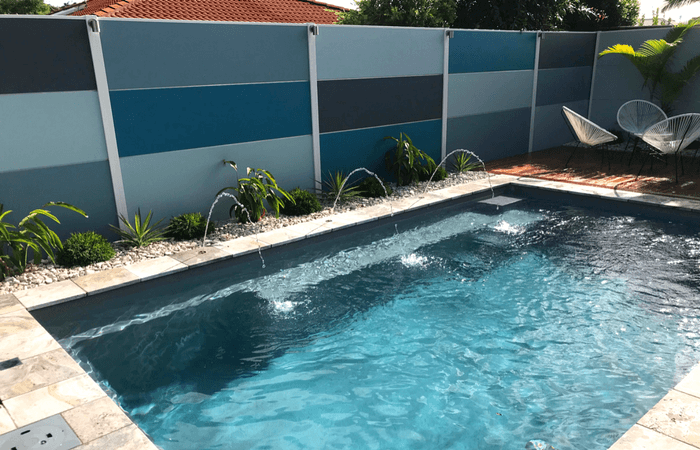 We caught up with Peter about his stunning backyard design and how he found installing our DIY SlimWall. Q. How much of the backyard renovation did you DIY? Peter: I did everything except install the pool. I come from a building background and my wife is a qualified Interior Designer/Decorator; she's the brains and I’m the brawn, if you like? Q. What were the most important factors when deciding on which boundary solution to use? Peter: The fence had to be able to achieve my wish, which was to give the whole backyard and pool area privacy and consistency, but also had to achieve my wife’s wishes - look good! We also had limited access to area, so the idea of large fence footings wasn’t suitable. Q. What guided you to SlimWall over other wall or fencing products? Peter: The overall look. We wanted a lightweight, manageable system, but it still needed to have the look we desired. We chose SlimWall because of its low profile, plus we wanted the expressed join feature. Our existing fencing was still in OK condition, but was very had inconsistent heights; we were looking at the back of all our neighbours’ fence extensions/bamboo/sheds, which was ugly. We also didn’t want to have to go and approach 4 different neighbours and talk them into replacing their fencing, so we installed it within 100mm of our boundaries. SlimWall was an ideal choice, with its 50mm thickness! Q. So how did SlimWall enhance your backyard design? Peter: Realistically, once I found your product, we designed the whole backyard around it! Before we found SlimWall, we were lost in how to achieve the look we wanted, without removing all fencing and then installing either rendered concrete walls or similar heavy, engineered solutions. The ability for us to DIY was a huge benefit — physically and logistically, as the wall was installed over many stages. Q. How did you find DIY installation? Peter: Our whole backyard project took 3 months, with the SlimWall done in stages - all up, though, we could have installed it all in a week. We needed to paint each modular section separately, front and back, before installation — this is where a lot of time was used up. We used a quality, low sheen paint (Taubmans Endure) with a medium range nap roller on the front face. On the back, we used a neutral coloured gloss finish, so rain can clean it off easily, as we can’t get to it. I pre-wired the 12v AC down lights before we put the post tops and capping channels on, which was very easy to duct through posts. We also left the aluminium expressed join features unpainted, to highlight the individual panels, and to match the lights. Q. And are you happy with the final result? Peter: Yes, very happy! My favourite element was the ease of DIY installation, while my wife is over the moon with being able to make a statement with what is normally a boring backdrop. Make a statement with a backdrop that's customised to your unique personal style. Give us a call on 1300 556 957 to explore the possibilities and start designing your dream outdoor space!